I have a 2x4 white Lego brick in the shape of a figure driving a go kart. It has a stalk to accommodate a head with Lego embossed on it. There is no serial number except for a 4 stamped underneath. 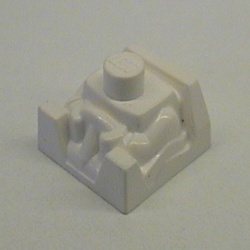 Does anyone know what this brick is and what set it's from? Not the answer you're looking for? Browse other questions tagged minifigure-identification or ask your own question. What set does this minifigure head come from? How can I tell which LEGO minifigure I found? can someone identify this lego character for me? What set is this minifigure from? What parts make up this mini-figure? What are the part numbers for the original brick minifigures? What mini fig/set is this shirt from? What minifigure has a textured lab coat?